Dr. Denis Melançon, passed away Thursday, January 21, 2016 at The Neuro, at the age of 81. Dr. Melançon’s career at The Neuro, where he was Director of the Department of Radiology from 1995 to 1999, spanned more than 40 years. 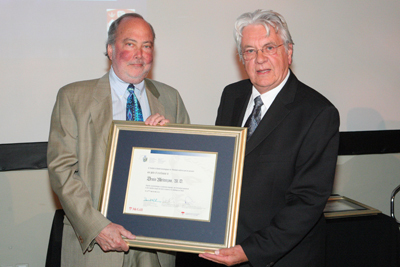 His outstanding achievements as a neuroradiologist are part of the history of radiology in Quebec and in Canada. He helped to pioneer CT and MR scanning. 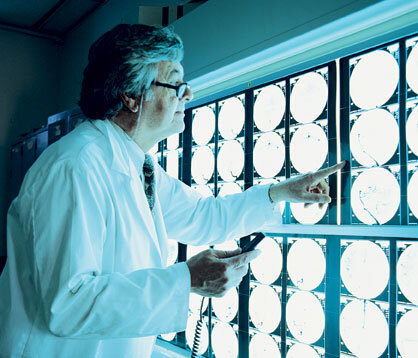 He gathered and analyzed data from many hundreds of brain scans to improve diagnostic accuracy. Scores of medical residents and fellows used the knowledge he gave them to make careers around the world. For the general public, he organized a major historical exhibition devoted to the history of X-Rays that was shown at the McCord Museum and at Ottawa’s Science and Technology Museum. He was the first president of FRER now called FARQ, the Association des radiologistes du Québec and served as president of the Canadian Association of Neuroradiology. He founded and maintained a quarterly magazine, Neuroimage. Dr. Melançon was highly regarded by his peers. The Neuro began its Denis Melançon Lecture series in 2008 to honor him in addition to bestowing him with a Lifetime Achievement Award. Among his numerous other distinctions was the Prix Albert-Jutras, a lifetime achievement award bestowed by La Société canadienne-française de radiologie, where he served as president from 1990 to 1992. Dr. Melançon was cared for with kindness and compassion by colleagues and friends at The Neuro. On behalf of The Neuro, we express our condolences to Dr. Melançon’s family. Family will receive condolences at Mount Royal Funeral Complex on Thursday, February 11, 2016, 6:00 pm to 9:00 pm and Friday, February 12, from 2:00 pm to 5:00 pm and 6:00 pm to 9:00 pm. A memorial service will take place Saturday, February 13, at 10:30 am in the chapel of the complex. Expressions of sympathy may also be sent to drdenismelancon@gmail.com. In lieu of flowers, donations can be made to the ‘Fonds commemoratif Denis Melançon’ of the Montreal Neurological Institute and Hospital. Dr. William J. Barkas Jr. passed away suddenly on December 24, 2015. Dr. Barkas was a neurologist at The Neuro, working primarily in the MS Clinic. He also worked with patients at the Constance Lethbridge Rehabilitation Centre. He retired in 2013.